A Chicago woman suffered a severe wound to her face Monday when the vape pen she was using exploded. The woman reportedly had the battery changed at a local vape shop and shortly after placed the e-cigarette in her mouth and began to puff on it. The explosion happened after she began using the vapor pen, which resulted in injuries to her face and set a nearby desk on fire. This isn’t the first injury of its kind. In May a St. Petersburg, Florida, a man died when his electronic cigarette exploded. The cause of death according to the autopsy report was a projectile wound to the head. The projectile was a section of the e-cigarette he had been using. 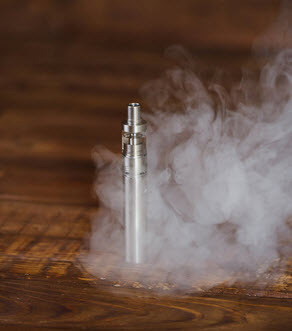 The U.S. Fire Administration reports that there were 195 e-cigarette-related fires and explosions reported by the media in the U.S. between 2009 and 2016.
Who is Liable for Vaping Injuries? If you or your loved one has been injured due to an electronic cigarette or similar device explosion, you could have a claim against any of the individuals or businesses listed above. You may be able to be compensated for your medical expenses, lost wages, loss of quality of life, emotional distress, disfigurement, and pain and suffering. The Boca Raton attorneys at the Leifer Law Firm have the experience and knowledge to assist you in wrongful death and personal injury cases that have occurred as a result of a vape device explosion. Lawsuits of this nature can be complex and lengthy, and the last thing you need while trying to recover from your injuries is the stress of trying to handle such a case on your own. Contact us today for a consultation so you can have peace of mind knowing that your rights are going to be protected.